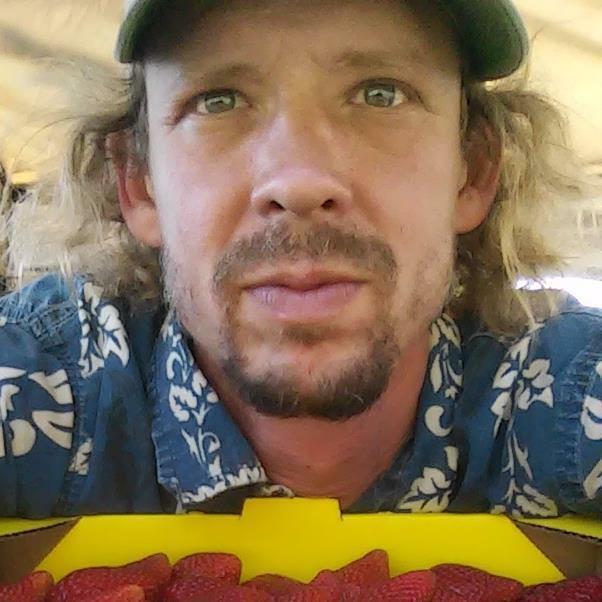 In 2013 Robert Brunet founded Einstein’s Choice Organics (EC Organics) in Monterey County after completing a one-year farm class and incubator program with the Agriculture Land Based Training Association (ALBA). During his first year, Robert leased a half-acre from ALBA in Los Lomas and began to sell his produce to ALBA’s cooler and distribution company, ALBA Organics. He then leased an acre of land at Triple M. Ranch in Salinas. Today, EC Organics is a five-acre vegetable, berry, poultry and beekeeping operation located in Aromas. EC Organics is certified organic through California Certified Organic Farmers (CCOF) and sells to restaurants in Alameda, Santa Clara and San Mateo Counties. The land EC Organics farms was not previously farmed, so it wasn’t yet optimally fertile and contained a lot of weeds. The sandy, loamy soil showed signs of erosion. Irrigation capacity was limited due to water supply issues, and the drought has made the crops susceptible to cucumber and flea beetles because dry soil enables the pest’s molting process. Finally, Robert lost acreage when his neighbor, from whom he leased property, sold the parcel, forcing him to disc in his blackberries and raspberries. Acquiring a long-term lease agreement is part of Robert’s overall sustainability strategy. 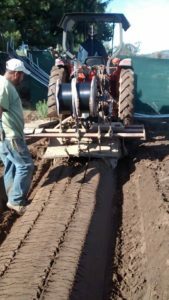 To address soil erosion, Robert constructed a drainage ditch, installing a pipe and digging a trench all the way to the property line to divert the flow of water. He worked with the NRCS to establish grasses in the roadways so that water could be diverted to crop beds, thus further reducing runoff and erosion in the rows. Keeping the rows aligned at an angle rather than directly downhill created the least amount of water runoff. Cover crop plantings of rye and vetch on the property’s hillside help secure the soil and aid soil fertility, as vetch adds nitrogen. Rye has deep taproots that pick up residual nitrogen, which reduces the potential for nitrate leaching into groundwater and conserves nitrogen fertilizer inputs. The rye taproots also facilitate water infiltration, allowing rainwater to infiltrate through the soil back down into the water table. The rye cover crop brings the nitrogen back up to the plant and provides a slow-release nitrogen fertilizer. To address the water supply problem, Robert combined wells and shares them with his neighbor so that multiple wells are feeding the same system and the storage tanks fill twice as fast. EC Organics received an Environmental Quality Incentives Program (EQIP) grant from the Natural Resources Conservation Service (NRCS), which allowed Robert purchase water tanks and a flow meter for the well. To control weeds Robert employs hand weeding, flame weeding near carrots crops, and plastic mulch on his tomatoes and strawberries. Compost applications assist with weed suppression, as do a flock of Plymouth barred rock chickens. As a side benefit, the chicken’s manure contributes to the development of soil organic matter and improves the sandy soil’s water holding capacity. The Central Coast Regional Water Quality Control Board Agricultural Order has initiated mandatory nitrogen reporting for irrigated lands. To protect surface and groundwater quality, every commercial crop producer is required to report nitrogen use. Robert fertilizes his fields using fertigation, and conducts soil tests to measure nutrient levels. By conducting analysis of nitrogen levels in soil and water, Robert is better able to budget nitrogen and take advantage of available nitrogen from cover crops. For example, a high-risk nitrogen crop such as kale requires monitoring under the Agricultural Order. Robert’s goal is to keep nitrogen in the root zone and eliminate the leaching of nitrogen to groundwater. Due to his management and the prevalence of like-minded neighbors, EC Organics has managed to keep nitrogen levels below the allowed threshold. Insufficient water storage has forced Robert to undertake time-intensive irrigation management, which involves applying water to a different area of the farm every day. Robert indicated that there isn’t the right amount of water at critical times and this places extreme heat stress on plants. His well pump is only 1.5 horsepower, and it takes 4 and a half hours to fill 7,500 gallons that can only be kept continuous if watering small sections at a time. This meant that irrigation was maxed out at ¼ of an acre-inch every three hours. Robert was constantly switching valves to apply as much water as he could however without the storage tanks he was forced to limit irrigation to about one-third of what the plants actually needed. Being limited to irrigating only two fields per day in hot weather resulted in crop loss and overuse of water. With water conservation and precision irrigation Robert has been able to adequately irrigate his row crops with ¼ inch per irrigation event. Robert was initially advised to combat the cucumber beetle with sprinklers, however, this wasn’t feasible for Robert given the farm’s water supply challenge. As an alternate approach, Rex Dufour at the National Center for Appropriate Technology (NCAT) recommended planting Hubbard squash as a trap crop. A secondary benefit of this practice is that it supports bees, primarily squash bees, a solitary native bee. 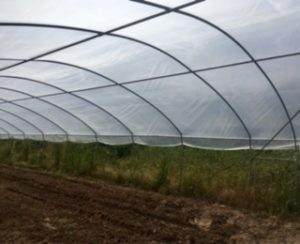 Robert also utilizes floating row cover to protect plants from flea beetles; the floating row cover provides a barrier that safeguards against pests while still allowing the plant to grow. Finally, Robert planted two hundred feet of native hedgerows and shrubs to better combat pests and increase pollinator habitat. The improvements he made to the soil with compost and cover crops has led to a 75 percent reduction in fertilizer costs without compromising his crop yield. The NRCS gave Robert access to two 5,000 gallon water tanks that will enable him to get irrigation water to the crops on a more timely basis, improve yields and cut irrigation labor by 50 percent.